Winterlicious 2019 in Bloor-Yorkville - Reservations are now open! Reservations are now open for Toronto’s annual Winterlicious! We’re proud to say over 10 Bloor-Yorkville restaurants are included in this year’s programming. Winterlicious offers guests the opportunity to explore the world-class culinary offerings of our city with three-course prix fixe menus for both lunch and dinner. For lunch, prices range from $23-$33 with dinner ranging from $33-$53. Bloor-Yorkville is home to some of the city’s most iconic restaurants and forward-thinking chefs; Winterlicious is the perfect opportunity to plan a night to visit old favorites or discover a new must-visit restaurant in the neighbourhood. Additionally, Toronto Fashion Week and Winterlicious have teamed up for Style Plate 2019: Food – The New Fashion. The unique event will be hosted at ONE Restaurant at The Hazelton Hotel with the acclaimed Chef Marc McEwan. Guests are invited to an evening of spectacular cocktails and hors-d’oeuvres featuring industry experts discussing the intersection of food and fashion. Tickets for this event are now available. 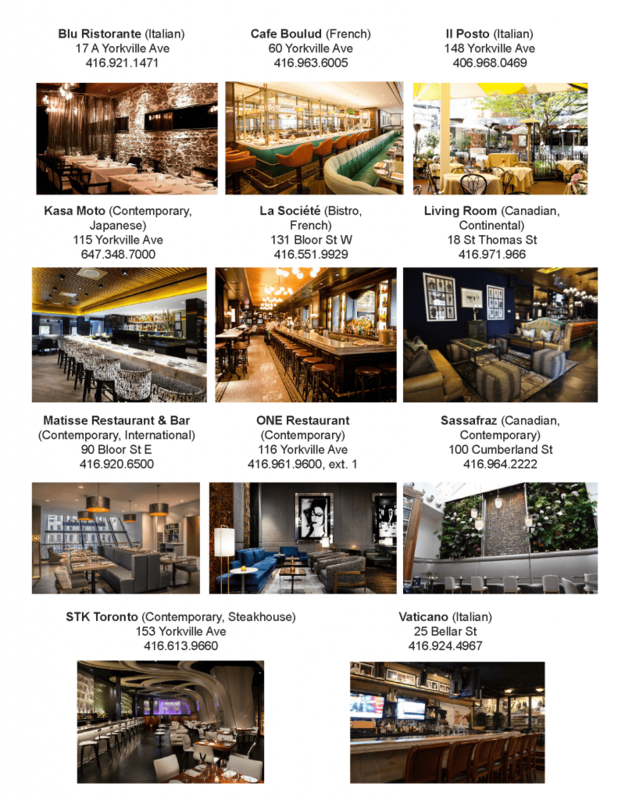 Below is the list of confirmed Bloor-Yorkville restaurants. Be sure to make your reservation sooner rather than later to avoid disappointment! Winterlicious takes place between January 25th – February 7th, 2019.